I just bought a 110 sq ft Flowform and will be flying it on 1000 lb line. What line spools/reels do you guys use. I've got a 50 sg ft Pilot and just use a ring reel for the 500 lb line and it works well. I've got 300 feet of 3/16 braided dacron but I'm not sure what reel/spool to get for it. Any day at the coast is a great day !!! do you have a pic of that big boy kite ? A kite that big is going to be tied off on something so...I have found that you can use just about anything, so there will be no pressure on the reel or what ever. Reels and winders are used for storing the line, letting it out, and winding back up when the kite is grounded. That would be about 1000 pound line. Just use a smallish stuff sack - something where you can get your wrist through the top, maybe 8"x12". Tie one end to the bag's cinch cord, let the incoming line run through the fingers of your left hand which is holding the bag, pull the line in with your right which doesn't really leave the bag. Assuming your a righty. Larkshead the kite-end loop to the cinch cord when it's all inside and it'll almost never become tangled. Much more compact than a hoop or flat winder for that weight line. I use a stuff sack for my 500# line, too. +1 for MtnFLyers advice......best way! Once it arrives I'll have some pics !!! I go with a stuff sack too for my bigger lines, ( 500#, 700# and 1200#.) Throw the sack on top of the kite in the kite bag and you always have it ready. I rarely get tangles and the few I get are easy to shake out. Nice big kite. Hey, who makes the shark drouge ? Would be nice on my Octo. Those were/are supposedly great reels although a bit cumbersome. Braced against your midriff and having that brake to slow or stop the spool, if you could hand hold the kite they would bring them down. My preference with big kites though is to walk the kite down and deal with line later. They were called Strato-Spools back in the 1980's 1990's I think. I guess it's all personal preference - with me walking kites down is exhausting but it was the only way I knew how to do it. Then a buddy of mine turned me onto this thing not sure if it's called a Strato-Spool but its awesome. I especially like the fact that I have multiple spools that I can change on the reel. 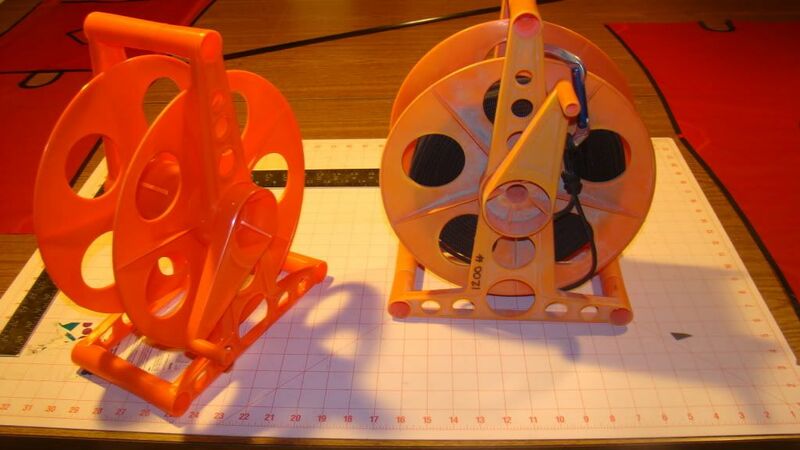 I usually will anchor about 3 kites with this one reel and 3 spools. When I reel it in I will use a pulley connected to an anchor.